All Southampton homes currently listed for sale in Southampton as of 04/20/2019 are shown below. You can change the search criteria at any time by pressing the 'Change Search' button below. If you have any questions or you would like more information about any Southampton homes for sale or other Southampton real estate, please contact us and one of our knowledgeable Southampton REALTORS® would be pleased to assist you. "Magnificent custom Estate sited on over 3 Acres with additional Pond Lot available. The 6 Car attached garage is ideal for the car enthusiast and is separated by an enclosed breezeway perfect for relaxing at day's end. Upon arrival you will be impressed with the Buck's County stone and maintenance free Cedar Impressions siding. Extensive hardscaping and Bluestone terraces also surround this exquisite gem. The double carved solid wood doors open to display a breathtaking space as the quality is immediately evident. The elevator will transport you effortlessly from the walk out finished basement to the upper level of the home. The Great room boasts 2 story coiffured ceilings with extensive built-ins carried through to the bar nook inviting conversation and complimented with a punched tin ceiling and gorgeous mahogany colored cabinetry. The study is conveniently located off the foyer and creates an atmosphere conducive to accomplishing your day's tasks. Sherlock would be proud! Expansive Woodmode kitchen is a chef's dream with it's 48 side by side refrigerator/freezer, commercial range & eye level microwave oven combination. Beautiful enameled backsplash with granite countertops, pantry & center island, yes, you CAN have it all! The 1st. floor master suite enters into a private foyer with laundry, closet and double doors that open to an opulent bath with steam shower, sauna & soaking tub. The master bedroom supplies sweeping views of the surrounding pond & farmland and is enhanced with a gas f/p & stunning tray ceiling. Access to the terrace area create the perfect sunset setting as you enjoy a nightcap to conclude your day. There are 4 additional bedrooms on the 2nd floor 3 of which have an ensuite bath. The back staircase is an added feature & works well for an aupair. The finished lower level with bath is enhanced by a sunroom illuminated with walls of windows and exited conveniently to the rear yard. There are 2 finished rooms in addition to the media room w"
"3 Bedroom, 2 1/2 Bath, 2559 sq.ft. Ranch House with a total of 16.03 acres of farmland! Includes a detached barn/farm tool shed totaling 2100 sq.ft. with 16 ft. ceilings! Property includes a portable, licensed heliport to have and fly your own helicopter in front of your home! There are 2 private wells, a detached pavilion (in photos), and a river situated on the property. Its convenient location just minutes to Highway 206 makes it about 45 minutes away from Edison, central New Jersey and about one hour and half from Queens New York. FARM EQUIPMENT ALSO AVAILABLE FOR SALE (FOR AN ADDITIONAL PRICE) PLEASE CONTACT FOR MORE INFORMATION." "Amazing private retreat! The 2 story vaulted entryway has French doors on either side to the living room and dining room. Through the living room is a brand new formal southern style porch that is calling your name. The kitchen has designer cabinetry & brand new granite counter tops and back splash. There is an oversized island, a butlers pantry and service area that houses a wine and beverage fridge. The owners have just added some newer updates to this already gorgeous kitchen. The 2 story family room has custom remote shades, designer drapes and a marble gas fireplace. There is an adjoining study just off of the family room. The master suite is fabulous with the largest walk in closet you ever did see! A marble fireplace and amazing master bath with a huge tub plus steam shower completes the suite. There's a laundry area housing a washer & dryer on each floor for added convenience. The backyard is fenced and professionally landscaped including a Swimmore concrete pool with hot tub & waterfall. Some new pool features...new pool pump (2018), newer filter (2015) and new wall tile (2018) and the 2nd zone HVAC was replaced in 2017. This very elegant home is truly gorgeous, tour this home so you can LOVE WHERE YOU LIVE..."
"Live and operate your business all at one location - Zoned Residential/Highway Commercial! 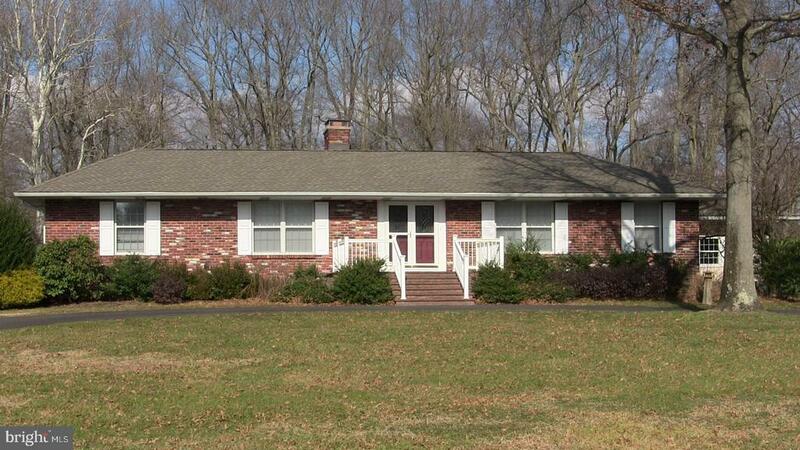 Ranch home with a huge 4 car detached garage with shop on 6.39 ACRES. Home has approximately 1800 square feet with 3 Bedrooms, 2.5 Baths, nice size Living room, Dining room, and Family room, fully finished Basement the entire space of the house, Laundry room and a Sunroom w/wall of windows. Black top driveway and parking for additional cars. Great opportunity with prime highway exposure and visible signage to advertise on Rt. 206! Front commercial building was previously run as a Custard Shop/Restaurant business with plenty of parking and easy in and out access from highway. Some possibilities would be retail commercial establishment, Personal and Professional establishments, Officer and Office Builds, Banks and other Financial uses, Electrical, Plumbing and other singular Supply Stores, Auto Repair and Gasoline Service Stations, Commercial Car Washes, many possibilities. Bring your investors or developers." "Magnificent estate home in the tranquil setting of The Grande at Burrs Mill has all of the best amenities and gives you an oasis retreat. Lush landscaping and a pristine exterior greets you as you pull up the extended drive. The dramatic, open foyer with cathedral ceiling, hardwood flooring and winding staircase welcomes you into the home. Separate formal living room and dining room give you space for entertaining and more formal gatherings. The additional morning room surrounded by windows is currently used as a billiards room, but would also make a great area for relaxing with morning coffee and a good book. The gourmet kitchen will meet all of your expectations with granite counter, a large center island with seating, custom cabinets, a lovely back splash. Upgraded stainless steel appliances and pendant lighting create a huge workspace. The adjacent breakfast area will accommodate the largest table. There is a large additional sunroom which gives additional space for entertaining and relaxing during food prep. The massive family room is open to the kitchen and boasts 2 story ceilings with dramatic molding. The overlooking balcony provides a dramatic view of the entire family room The formal office on the main level creates a space for anyone working from home or for a study area. There is a back staircase from the kitchen to the 2nd floor sleeping area. On this level the enormous Master Suite has a separate sitting area with a fireplace; a tray ceiling and a huge walk in closet. The Master Bath is spa like with a soaking tub, and a separate over sized shower with frameless door and double sinks. There are 3 additional bedrooms and a 2nd bath on this level. Need more space? The finished basement has a window walk out well with a 5th bedroom and a full bath. There is a sitting room and a huge 2nd family room which would be used as a media room. You can enjoy your outdoor living space complete with a paver patio, a hot tub! The 3 car garage and t"
"Stunning and Elegant Custom Built Colonial residing in the lovely development of Pricketts Mills Estates/Eaglesmere. This home is situated on a corner lot and has 3,700 square feet. It has approximately 2.26 acres, and has been professionally landscaped. The Exterior of the home has an extra large driveway to accommodate 4 + parking, plus 3 Car Garage (with new insulated Carriage House Garage Doors, with Openers), plus a large private fence. It has a beautiful in ground pool 18~ x 36~, a screened in gazebo, Storage Shed 8~ by 10~ and an Outside Building 12~ x 24 ~with Electricity for the Electric Generator, plus an oversized Deck which is 13~ by 53~ and Outdoor lighting. This beautiful 4 Bedroom, 2-1/2 Bath home is ready to move right in. As you enter the foyer, you are amazed at the spiral staircase with the high ceiling and all the natural light. The Living Room and Dining room are spacious, bright, and, a great area for gathering the family. Everyone can retreat to the spectacular Family Room. Enjoy the warmth of the brick wood burning fireplace, accented by brand new fireplace doors, and enjoy the large windows bringing in the outside views, plus having easy access to the oversized private deck. The first floor has an Upgraded ~ Bath for convenience. This home offers a gourmet kitchen with Granite Countertops, Prep Sink, and a great island for preparing for those entertaining occasions, a extra large pantry, plus, a full breakfast room with lots of light and another access to the deck for that morning coffee. The Master Bedroom is Hugh with several large closets, and, has a extra large Master Bath with a Jacuzzi , Double sinks, and Walk in Shower. In addition, 3 more nice size bedrooms with lots of storage. In addition, a private office with a outside area to retreat to hear the birds outside. The In ground Pool is gorgeous with beautiful scenery, a gazebo, oversized deck to enjoy a Family Day. And, an extra High 12 Course Block Basemen"
"Welcome home to this beautifully redone, spacious home on a wooded lot in Southampton! The updates start before you even enter the home with the new on-trend blue siding, new roof, new gutters, new blue stone front stoop, new front door, and updated septic and well. Entering the home, you are greeted with a 2 story foyer and new hardwood floors that run throughout the first floor. To your left is the dining room with two Palladian style windows and a chandelier. Opposite the dining room you will find the living room and conservatory with 10 foot ceilings. Returning to the foyer and moving toward the rear of the home, the 2 story family room boasts a new gas burning fireplace, huge windows that let in lots of sunlight, and an extension that can be used as a playroom. To the left of the family room is the elegantly appointed kitchen. The kitchen features new stainless appliances including a 5 burner slide-in range, a beverage fridge, granite counter tops, a full pantry for extra storage, a large island with overhang for seating, and full-wall backsplash. The new Andersen slider leads to the rear wooded yard and new concrete patio. The second floor offers four bedrooms and a full bath. You will love the master suite with new carpeting, dual walk-in closets, and an elegant, spa-like bath entered via French doors. Soak in the free-standing tub or enjoy a hot shower in the modern, glass-enclosed stall shower. Wood-look tile, a double vanity with lots of storage and marble counter, and a linen closet complete the bath. Three more bedrooms and a full bath with fully tiled tub/shower combo and double vanity complete the second level. The living space doesn~t end here, though. The full basement is newly finished and features a full bath. Throughout this home there are a number of upgrades including: new Andersen windows, new LED recessed lights, new 5~ baseboards, new light fixtures, fully remodeled baths, new wall to wall carpeting, new 2 panel interior doors, new hardware, "
"Location Location Location -Want to be close to daily activities, yet have space with peace and quiet without too much maintenance? This is your answer. Custom ~built cape-style surrounded by preserved farmland. Over 2800 square feet of living space, full basement, main floor bedrooms and office- contemporary open floor plan with vaulted ceilings, hard wood flooring, transom windows and skylights -Gourmet kitchen- granite counters, 11~ breakfast bar, double oven with gas stove, stainless appliances, huge pantry and the large dining area. Sunny 16x17 morning room. Great room - built-in cabinetry, stone front fireplace. Master Suite - walk-in closet, 2 additional closets, soaking tub, separate tiled shower, double sinks, linen closet, vanity and a heated floor. 2nd bedroom on the main level could serve as a guest / in-law/ nursery. Private study with French doors. Main floor laundry room, mud room, and powder room. 2 large bedrooms upstairs, both with walk-in closets, a full bathroom and 19x19~ loft with an office alcove -Full, dry basement -partially finished with outdoor access. 4-CAR heated GARAGE with attic storage and front and back entry, dual zoned heat and A/C, solar panels, sprinkler system, security system, septic system installed -2018, new well tank and pump, and tons storage. The private backyard has a 15x22 deck, shed -spectacular sunsets. It is walking distance to the school, the new recreation fields/ walking path, the town center, library and Saw Mill Park, with easy access to military base, Philadelphia, the Jersey shore." "WHEN ONLY THE BEST WILL DO...custom built Lincoln Log home being sold by original owner with a lot of behind-the-scenes quality. Tongue-n-groove pine paneling, thermal home R-25 rating, 8 outer walls, approximate well depth of 165 feet, poured basement walls with 10 concrete...and the list goes on as to the unswerving commitment to quality. Step saving kitchen with hickory cabinetry, granite counters, center work island, built-in counter bar that overlooks an open and inviting Great Room with vaulted ceilings, skylights and woodburning fireplace made of Valley Forge stone. Recessed lighting thru-out. 2 French doors lead out to wrap-around decking that overlooks a back yard of pastoral pleasure. Main floor master bedroom with master bath. Open 2nd floor loft area leads to 2 upper floor bedrooms serviced by full bath. Full, finished basement with recessed lighting, granite counter bar with wet sink and refrigerator along with Beer Meister. Basement also offers a full bath and nicely finished bedroom. The basement is easily accessible for ingress and egress through an open, exterior walk-out doorway. 2-car, 26 x 26 garage that is heated and air conditioned with inside access, 12' ceilings and 9 x 9 insulated garage doors. Main home is serviced by oil F/A heat (oil tank is in the basement). Spacious Mother-in-law suite may be accessed by way of the main home or by separate entrance offers kitchen/living room area, bedroom, and full bath with chair lift access. The Inlaw suite has separate propane gas heat, separate central air, and the electric is shared with the main house. Seller offering American Home Shield 1-year home warranty. Outdoor 26 x 20 pole barn lends to various uses. A horse? Of course! EVERYBODY'S GOT ROOM HERE!" "Character and charm will welcome you to Vincentown Village and this fresh NEWLY updated 5 Bedroom, 2 Full Bathroom Victorian home built in 1865. First owner other than 6 generations of Iricks. Newer cooper roof, new storm window inserts, new boiler and water heater. 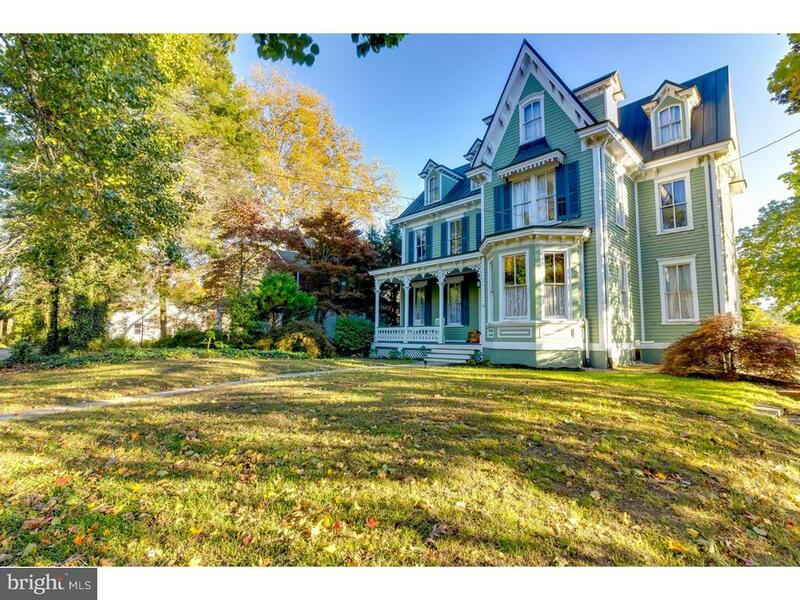 This Victorian residence, located on over half an acre, has been meticulously loved and features great curb appeal and a walkway to the backyard pavered patio and bar to die for. Relax and enjoy your cup of morning coffee on the rehabbed front porch. Enter into the foyer, w/9 ft+ ceilings, with the living/great room and office caddy cornered on either side. The attention to detail to the woodwork, crown molding, solid wood doors and original hardwood floors in this home will leave you in awe. Venture down the hall into the dining room with the ability to entertain large amounts of guests for dinner parties. Continue into the Eat-in-Kitchen boasting finishes like granite countertops, Energy-star stainless steel appliances (coverted to gas), 42 cherry cabinets, backsplash, ceramic tile floor and extra cabinetry with plenty of room for storage that is sure to bring out the chef in you. Off the Kitchen is a full bathroom in the hallway w/stall shower w/ceramic tile, toilet and circular vanity w/marble top. The kitchen enters into a 4 season room (sun room), w/recessed lighting and newer slider, where you can enjoy the breathtaking views of the great outdoors when you can't venture outside due to cold weather in the winter. Make your way to the 2nd floor w/4 large sized hardwood floored bedrooms, full bathroom and convenient located laundry room w/top loader washer, front loader dryer and sink. The hallway bathroom includes a claw tub, toilet, vanity on top of ceramic tile. The 3rd floor also consists of a loft, walk-in-closet and two additional hardwood floored rooms. Walk back down to the first floor into the partially finished basement, consisting of a bar and game room. 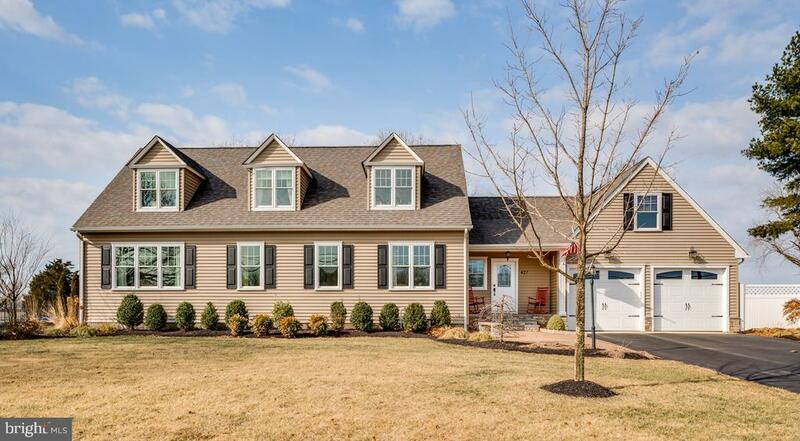 Venture outside and relax around"
"Formally Model Home for the Eagles Mere, this great 3000sqft home, 4 bedrooms 2.5 Bath Center Hall Colonia home Located on a Cul-De-Sac on 1.02 acres home site. This offers, a Brick Fireplace in the Great room with a bar and a wine cooler. Hardwood floors in the kitchen and the stepdown Breakfast area with Vaulted ceiling, Skylight and a French Style sliding door to a large deck. The Main Bedroom offer a sitting area, two walk-in closets, and an-suite bath with oversize jacuzzi tub. I invite you to visit this home and experience for yourself the quality and features this home has to offer." 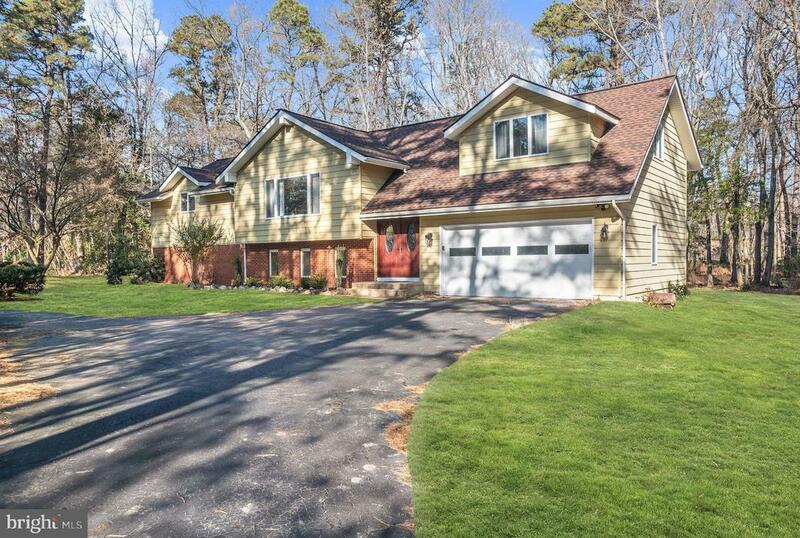 "Beautiful home with impeccable curb appeal offered in the sought out Burrs Mill Estates. 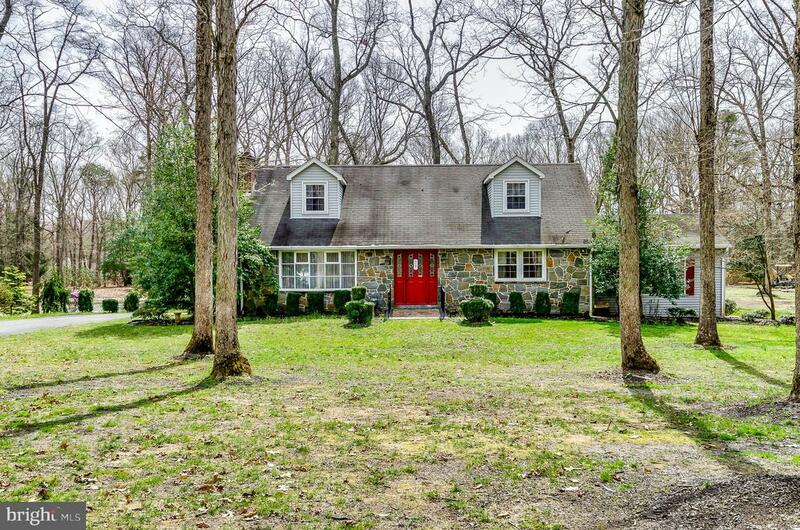 This home is a true turn key! The main floor boasts hardwood floors in the foyer and dining room. The living room and large family room with fireplace have upgraded newer carpet. The enormous kitchen offers granite, stainless steal appliances, double oven, large center island, upgraded trim work and ceramic tile. Downstairs you will also find a large laundry room and completely remodeled half bath. Head upstairs to the oversized master suite with large walk in closet and beautiful master bath with shower, whirlpool tub, and double sinks. Three large bedrooms and a full bath with double sinks complete the upstairs. There is a full unfinished, insulated basement that could easily be finished. Head out back and relax on the deck while you take in the meticulous landscaping. The list of updates is long. Hot water heater and Geothermal HVAC system were replaced in 2015. A brand new well tank was installed in 2015. New roof and exterior doors in 2014. And brand new garage doors in 2018! All of this offered on over an acre lot at a great price! Don't wait!" 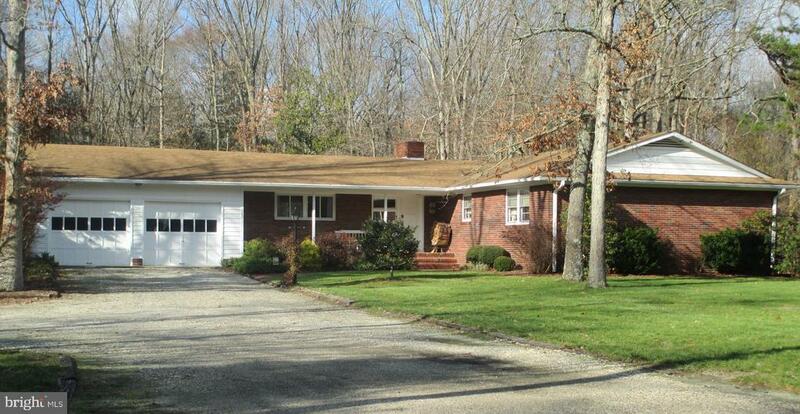 "Rare find in Southampton on 1.6 ACRES, property Zoned Residential and Commercial . Work and live at your property with good sign visibility and highway frontage. Ranch home includes 3 bedrooms, 1.5 Bathrooms, Kitchen with breakfast area, Dining Room, Family Room and full Basement. There is a nice size back yard with storage shed and nicely treed property. Call Listing agent to view this unique find." "Welcome to 8 Hamilton Court on a quiet col de sac in desirable Eagles Mere! This bright and airy 2700 square foot home sits on a large picturesque lot with lots of privacy. Enjoy the peace and tranquility of the backyard from the enclosed porch! Inside you will find plenty of room to entertain your friends and family. The multiple living spaces feature custom woodwork, built in shelving, and wood-burning fireplaces. A full, unfinished basement provides room to expand as well! The tastefully designed eat-in kitchen boasts wrap-around counters, plenty of cabinet space, and breakfast bar. Other highlights include glistening hardwoods, ornate trim, exposed beams, recessed lighting, and soaring ceilings. The three spacious bedrooms are pleasantly removed from the main living areas and provide lots of closet space. The master bedroom features a huge four-piece bathroom with soaking tub. The 8x10 bonus room could be the perfect nursery, office, hobby room, or additional storage space. An over-sized 2-car garage and expansive driveway provides ample parking. 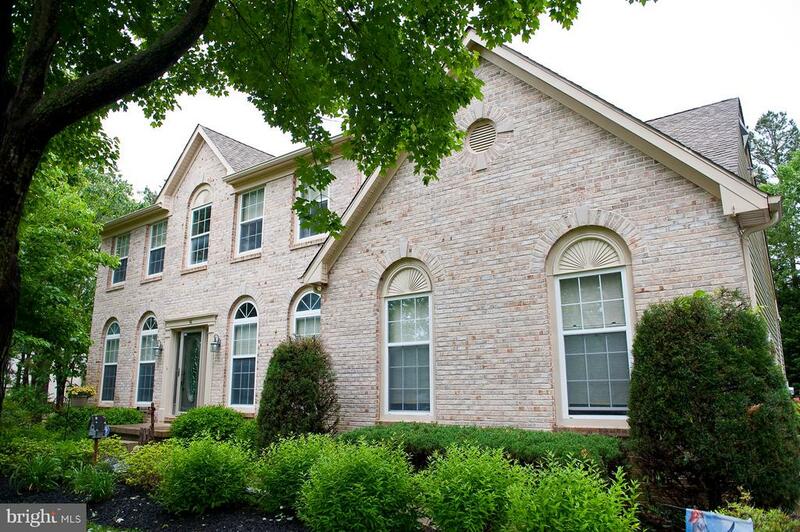 Eagles Mere is a quiet and walk-able neighborhood in a great school district! 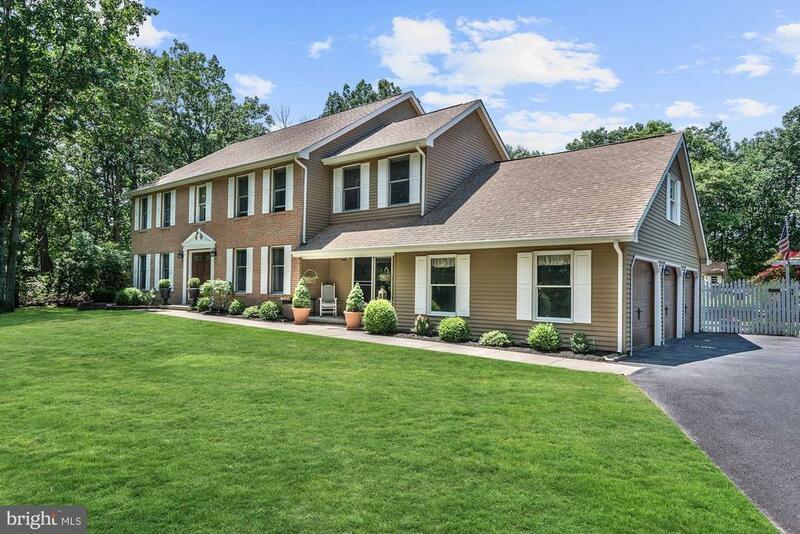 This home is conveniently located near many popular restaurants, nature trails, convenience stores, and provides easy access to route 70 and 206. Make your appointment today!" 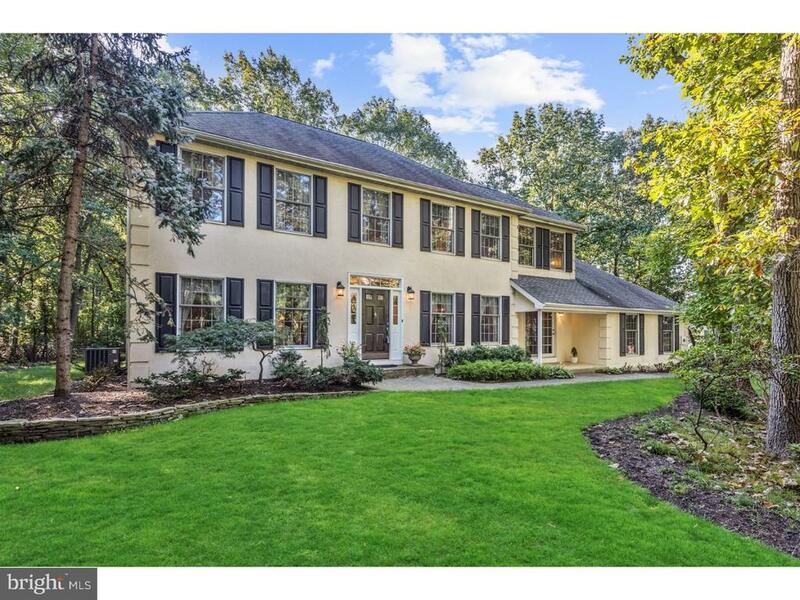 "Welcome home over 10+ acres of privacy in desirable Southampton Township. 20 horses allowed on this property as per township code. Previously a goat farm this property could have great possibilities as a dog kennel, horse, goat or llama farm. A tree farm or gentleman's Farm. All 10+ acres are high and dry with no wetlands on the property. This land features a 3 bed 2 bath expanded rancher with a full basement and attached two car garage. There are truly and less possibilities. This property is available in its present condition or can be purchased with all new fencing and new outbuildings and updates for 524,900. USDA FHA 203k and VA financing may be available. Call with any questions." 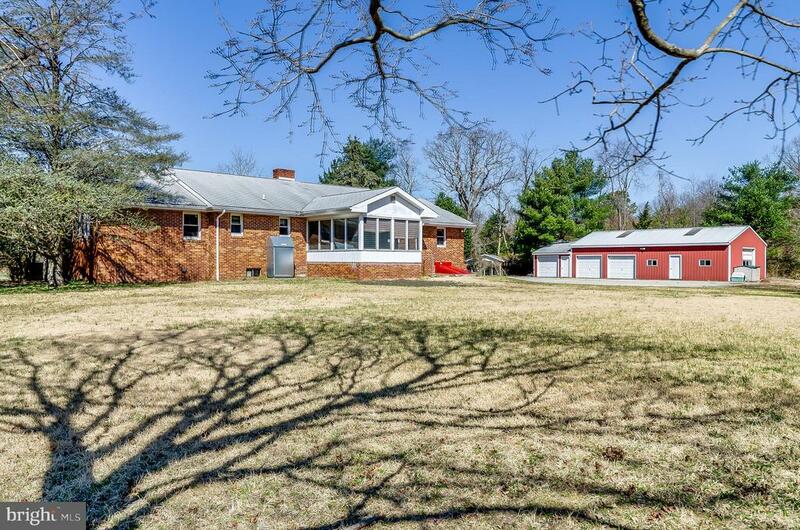 "Spacious,all brick custom-built ranch home offers four bedrooms, two full baths, two-car attached garage and a huge partially finished walkout basement. It~s situated on a 1.2 acre lot with 214 ft. of road frontage. TAXES less than $7,000 per year. The first floor offers a great room with a New Jersey fieldstone fireplace with wood-burning insert and sliding doors open to the rear deck. You~ll love this huge country kitchen featuring a vaulted ceiling and walls of windows with serene views of the wooded yard, a French door provides easy access to the rear patio There is gleaming hardwood oak flooring under the neutral carpeting. The hallway leads to four well-sized bedrooms and hall bath. The master bedroom features a walk-in closet and private master bath. The very spacious basement is partially finished with a 25 x 18 family room with brick fireplace, bar area, 13 x 13 den/office with closet, 27 x 13 utility/laundry room, 27 X 17 workshop with walkout and 11 X10 storage room. 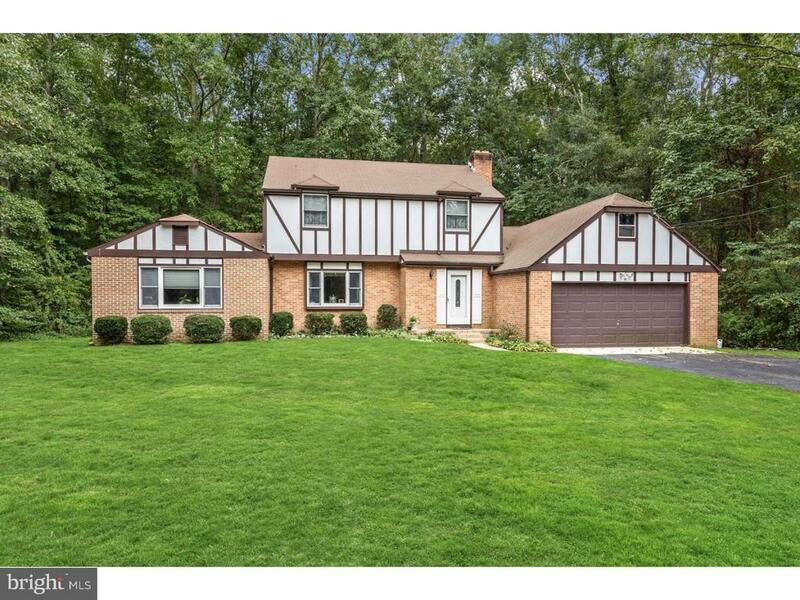 This home sits on a nicely wooded lot with lots of room to spread out. 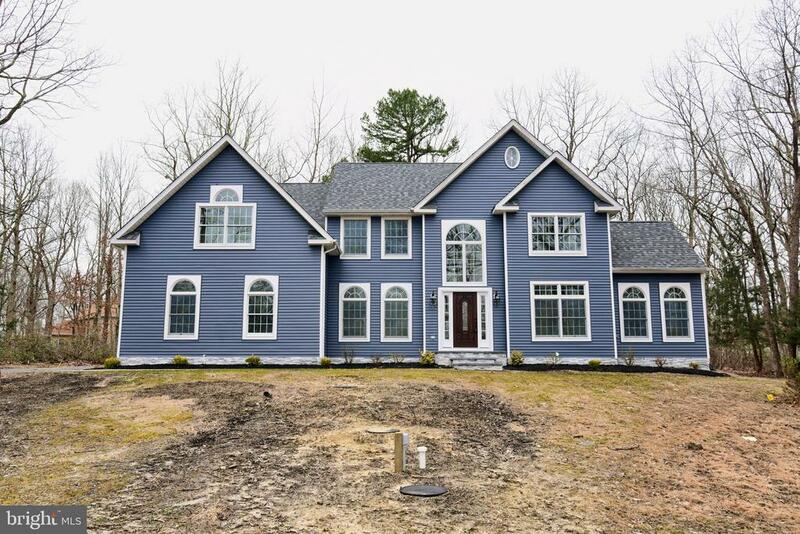 Southampton Township school system is excellent and high school students attend Seneca High School, the newest high school in the Lenape Regional High School District.Note; new septic coming soon"
"Lovely country cape located on desirable Ridge Road in Southampton. Everything has been done for you - just move right in. Special features include a full unfinished basement - use your creativity and finish however you wish. The dining room has a large storage closet and wainscoting. From the kitchen you will find French doors leading to a beautiful sunroom with wrap around windows. You will also be able to access the wrap around porch. There are three spacious bedrooms with the master being located on the main floor. The seller has installed a new septic system with all approvals. There is room for multiple car parking. Won' last long!!" "Large, corner property on acre lot in popular Ridgetree community. Newer hardwood flooring in the kitchen with directional lighting, ceiling fan and an open concept to formal dining room. The Master suite is conveniently situated on it's own level and offers two walk in closets and the full bath with separate sinks and vanities separated by the tub and water closet area. Three additional bedrooms can be found as you step up to the upper level off the living room. Here you will find an beautiful updated hall bath with double vanity and large tile shower with frameless shower door.. The living room is lit with a large bay window and vaulted ceiling to further open up the space and will warm you on a cold winter's day as it is enhanced with a wood burning brick fire place which creates the focal point in the room and extends into the formal dining room. The updated kitchen offers stainless steel appliances, granite countertops, ,hardwood flooring ,backsplash and shaker style mocha maple cabinetry. Enjoy movie night in the spacious family room with an additional wood burning fireplace or a game of ping pong in the same level game/utility room. The laundry room doubles as a powder room and the oversized 2 car garage offers a newer double insulated door. If you're looking for a spacious unique floor plan offering lots of options then put this on your short list. We welcome you to make this special house your new home." 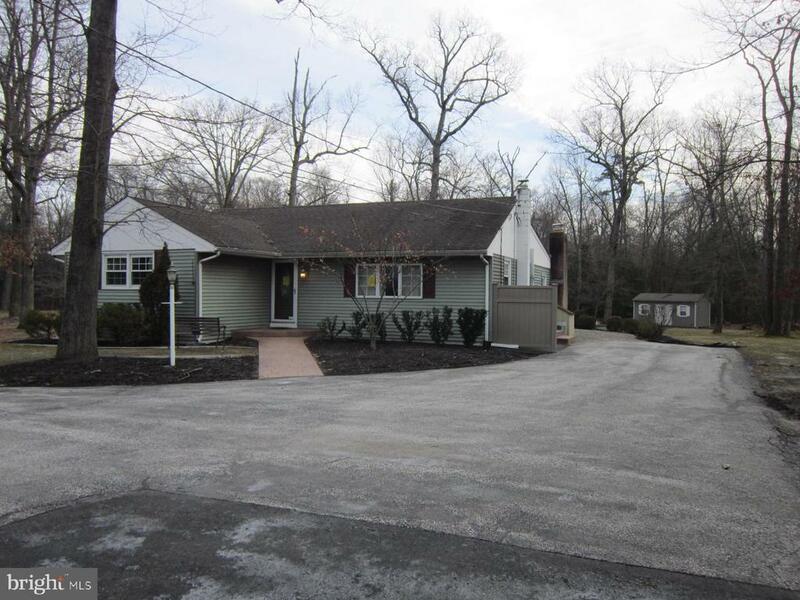 "Outstanding opportunity in Southampton Township. 20 acres ready for a new owner. Great investment possible with a subdivision, or build your dream house, with plenty of open space for horses or farming. 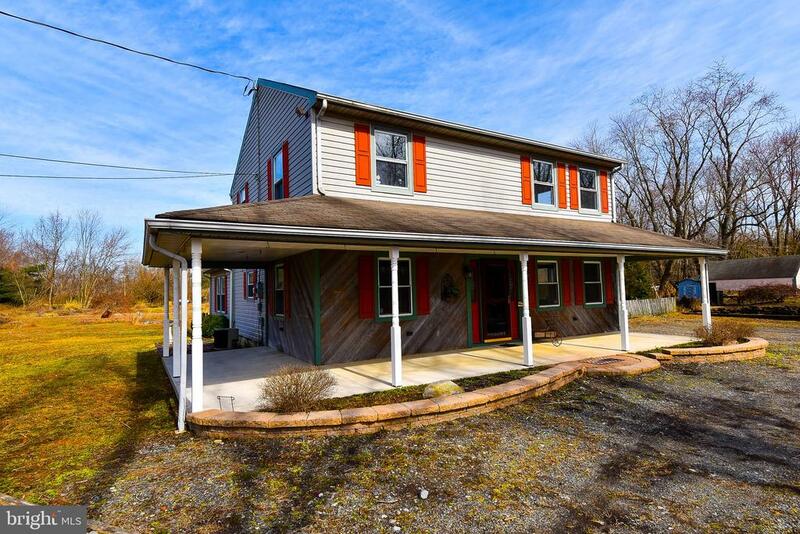 This property is in a great location close to major roads, in Lenape School district surrounded by continuous green acres. The farm land is currently rented out to a local farmer." "This is it, an adorable home in Southampton on a tree-lined drive with 2+ acres and cute wrap around covered porch! As you enter, you will adore the open concept Kitchen, Dining, & Family room with gorgeous custom floor to ceiling built-ins! Chores are a pleasure in the great-sized main floor Laundry room with ample cabinetry. Find the Master Bedroom with 3 closets & an oversized ensuite Bathroom on the main floor in addition to a large Office that could double as a second main floor Bedroom as it also has an ensuite Bathroom! Ascend upstairs to the 3 large bedrooms all with huge closets as well as a third full bathroom on this level! The home awaits your personalized flooring and paint colors and the current owner already removed some of the dated carpeting from the main floor for you! The future homeowner will love that there are ceiling fans in all rooms as well. The size and layout of this home inside will wow you, it underwent almost a complete rebuild/renovation in 1995 by the current owner! The detached garage/barn space adds ample space for any hobbies you may have and the electrical components are already in place for an above ground pool! To top it all off, if you desire to operate a business from your home, this property has endless possibilities as it is currently zoned as Residential in a Commercial Zone. The new owner could simply apply for Commercial usage with the township zoning board. 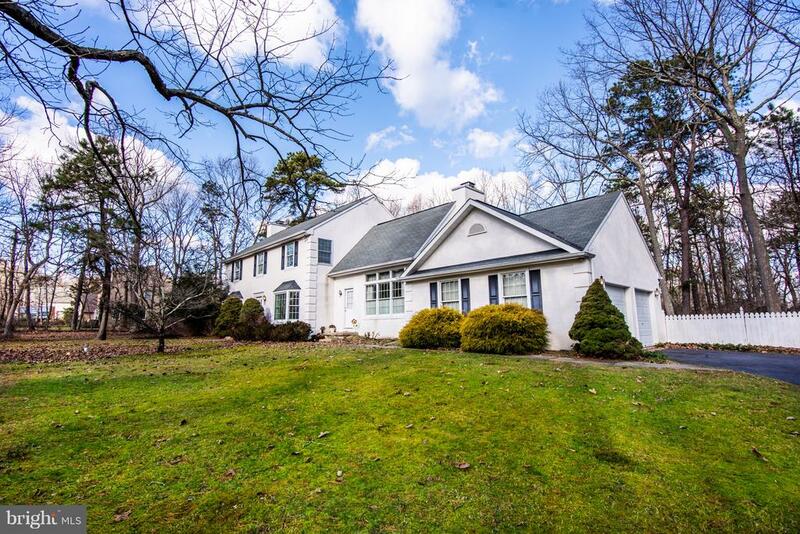 This wonderful-sized home is conveniently located near Route 70 & Route 206 but far back from Red Lion Road on a long tree lined drive - wonderful privacy meets equally attractive accessibility. Come see it today and be the lucky new owner!" "Unique and exquisite is the only way to describe this completely renovated home located in the Southampton. Additional information and features to follow, Please call with any questions." 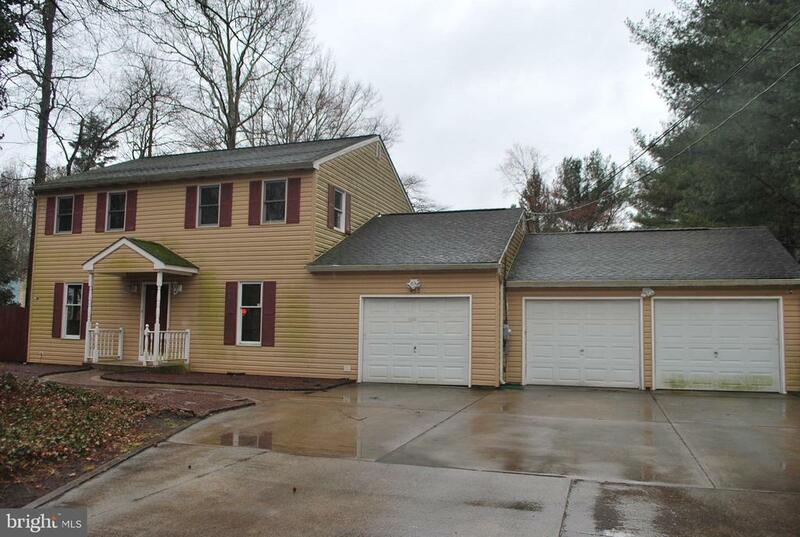 "Spacious colonial with 3 car attached garage and an over-sized shed in backyard. Plenty of parking provided with garage and the large driveway and lots of space for storage! Generously sized deck off the back of the house which is great for entertaining or simply just to kick back, relax and enjoy some fresh air. This is a Fannie Mae HomePath property." "BACK ON THE MARKET! Buyer's mortgage fell through. Could you have ever imagine you could own a 3000+ square foot property in a fabulous school district with 4 to 5 bedrooms including a first floor master suite easily used as an in-law suite at this price!!!! The owner has lovingly cared for many years and the care and attention is obvious. The updated kitchen with center island is extremely spacious and the rear yard is open yet bordered with trees for privacy & tons of enjoyment. Does it have some wallpaper? Yes! Could it use new carpeting in some areas? Yes! But don't you think that's a small price to pay for all this?? The original 2nd floor offered 4 bedrooms however with the addition of the main level master suite 2 of the bedrooms were combined creating an alternate master or teen suite. The addition features a main level master complete with luxury bath with jetted tub, separate office, ensuite sitting/exercise area and large walk in closet. And with 3 full baths plus a main level powder room you will never have to share again! SWEET! There will be a new septic installed once a contract is signed so the buyer can participate in the location of the drain field. Some savvy and very lucky buyer will be the recipient of this unique, spacious and well loved home." "Don~t miss this terrific Laurelton model w/ Loft and ~Gas~ Heat w/approximately 2,000 sq ft of living space and is located on a premium lot with private treed back yard! 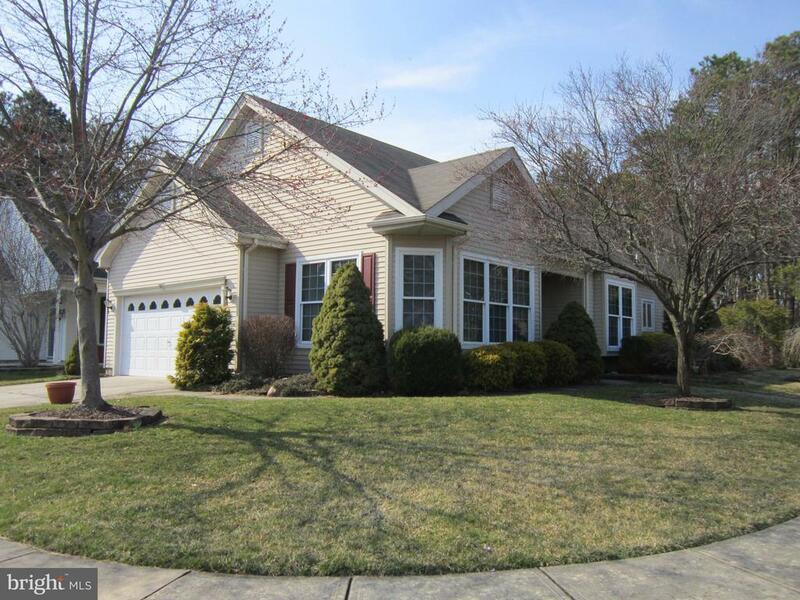 This spacious home features hardwood flooring in the Foyer , the Kitchen and Family Room. The Kitchen includes Corian countertops, oak cabinetry, island and separate pantry. Family room is conveniently open to Kitchen and leads out to the no maintenance fenced-in expansive back yard patio with a retractable awning-perfect for entertaining! There is a separate laundry room, 9 foot ceilings and 6 panel doors throughout. Master suite is very spacious with walk-in closet as well as a standard closet. Master Bathroom has double sinks and oversized shower. The guest bedroom includes a Jacuzzi tub for those relaxing baths. Home is neutral throughout with abundance of natural light. Upstairs Loft has double rails and would be perfect for a guest bedroom, office craft or another relaxing extra bonus room. Make this home your own!"